Yarn Type SALE 50% OFF! 100% Britsh Wool. Hand wash only. A simple sweater to knit using increasing and decreasing to create a slightly shaped silhouette. 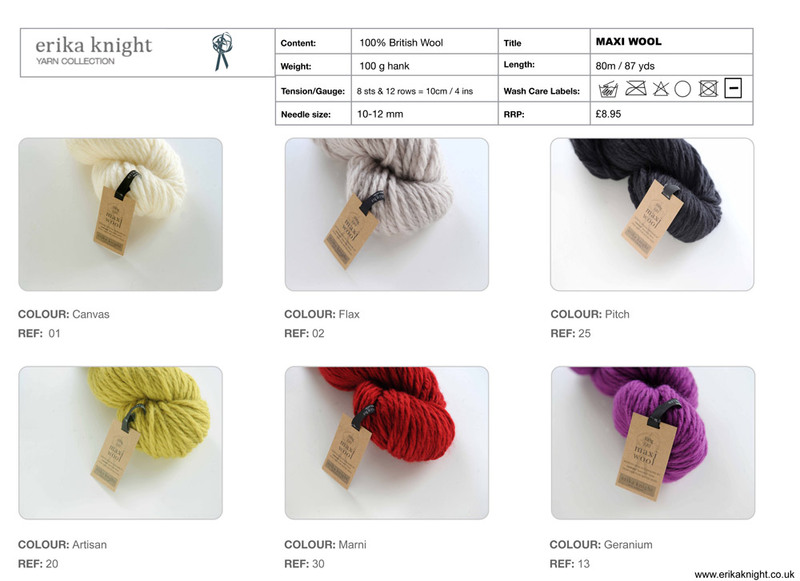 Made in 'Erika Knight' Maxi Wool, a soft and natural yarn spun in Yorkshire, England. It is knitted in basic stocking stitch (stockinette) and has a simple round neck and elbow length sleeves. Make it in winter brights or classic neutral colours. A short sleeved jacket knitted in 'Erika Knight' Fur Wool. It is made in one piece, kimono style, with the cuffs and front trims worked in contrasting 'Erika Knight' Maxi Wool in toning colour. Make it in natural Flax or Storm grey or add a fashion colour 'pop' to your outfit with Mallard, Marni or Mulberry. Quantity needed: 5(5:6:6) x 100g (3.5oz) hanks 'Erika Knight' Fur Wool and 1(1:1:1) x 100g (3.5oz) hank of 'Erika Knight' Maxi Wool. A simple bag made in 'Erika Knight' Fur Wool and a toning colour of Maxi Wool. Easy and quick to knit in stocking/stockinette stitch. It has a round furry base and sides and contrasting texture Maxi Wool handles. A simple fabric lining adds a professional and practical detail. Size: One size, approximately 35cm/13.75in tall x 30cm/12.5in diameter excluding handles. Large-eyed blunt tipped sewing needle. Very easy fingerless mittens to knit from one hank of Erika Knight Maxi Wool. With Maxi Wool this makes a perfect project to knit in a night. Great in a seasonal bright colour to bring last year's coat right up to date! Quantity needed: 1 x 100g hank. Needles Required: 12mm, Cable needle, Sewing up needle. Seasonal mittens to update your style this winter. Warm and cosy with the oh so essential fur cuff! Quick and easy to knit in basic stocking stitch and knit one, purl one rib stitch. Some very simple decreasing and increasing and all worked in Erika Knight British wools. A basic snood design that is really quick and easy to knit in Erika Knight Maxi Wool. It is worked in a simple rib stitch, in 100% pure natural British wool, making this not only a beautiful accessory, but also keeps British sheep roaming our green and pleasant pastures. Knit it in either classic neutrals or seasonal bright colours. Quantity needed: 2 x 100g hanks. Needles Required: 12.0mm, Sewing up needle. A simple 'starter' sweater to knit. Made in Erika Knight Maxi Wool, a soft and luxurious yarn spun in Yorkshire from a unique blend of the finest British fleeces. It is knitted in basic stocking stitch; one row knit, and next row purl alternately. It features simple increasing and decreasing of stitches and better still it grows on the needles very quickly. It's a great piece to add a little bit of 'cosiness' and colour to your wardrobe whether in this winter's 'brights' or classic neutrals.